As a child, Andrew Pike watched as his brother and uncle served in the military. He knew from a young age that he would follow the same path. He enlisted in the United States Army and deployed to Iraq in August of 2006 with the 1st Battalion, 505th Parachute Infantry Regiment, 82nd Airborne Division. On March 26, 2007, Specialist Pike was on patrol in Bayji, Iraq, when he sustained a gunshot wound to his abdomen. Thankfully, a fast-acting Army surgeon, Captain Yamamoto, was able to stabilize him quickly and save his life. 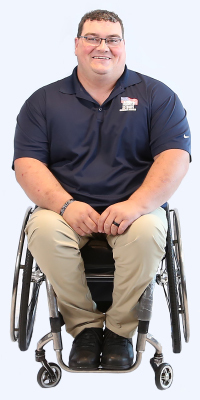 SPC Pike’s injuries resulted in complete paraplegia of the lower extremities. This injury did not dampen SPC Pike’s spirits. After months of rehabilitation at Walter Reed Medical Center, he returned home. Now medically retired, Andrew leads an active life in spite of his injuries. He enjoys hunting and fishing. He has also taken up archery and is training to compete in the Paralympics. He is a beekeeper and maintains several hives. He says the extra space in a specially adapted Homes For Our Troops home will allow him to grow this hobby. Most importantly, an HFOT home will benefit Andrew’s family life. Andrew lives with his wife Becca and three daughters. Taking care of “his girls” was the main motivator for Andrew to apply for a home through Homes For Our Troops. The realities of parenting in their current home are difficult to manage. The doors are not wide enough for his wheelchair, and he cannot easily access the twins’ room. A Homes For Our Troops home with wide doorways and an open floorplan will solve this issue for Andrew. “The new home will allow me to be able to watch my family grow and move on in life, without the worry of wondering if I can get around or provide for my family,” he says. Originally from Idaho, Andrew is choosing to remain in the state and build his home near Boise for the rural feel of the area. Andrew is grateful to the supporters of Homes For Our Troops and looks forward to the security his new home will provide. “Being able to move freely means everything. This home is the pinnacle of freedom for me,” he says.